If we're going to stay true to EVE Online going on forever, then at some point the current gameplay of EVE is just not going to be as relevant as it was. Last year, 6,142 EVE Online pilots flooded into the solar system of 9-4RP2 and participated in its biggest single battle ever—setting a Guinness World Record for most participants in a multiplayer battle in the process. But that record-breaking fight also illustrated how parts of EVE Online are aging much worse than others. The crippling lag created by 6,000 players smashing as many ships together was devastating to both sides. Everything slowed to a crawl, and the biggest threat became the random disconnects that pulled players from the fight. This May, EVE will turn 16 years old. To keep its promise to make EVE Online live forever, developer CCP Games is experimenting with ambitious networking and simulation technology that could radically change (and improve) its aging infrastructure, unlocking all sorts of new possibilities. During the Game Developers Conference in San Francisco last week, EVE Online partnered with Hadean, the makers of an innovative game engine called Aether, for a grand experiment: Could they run a 10,000-player multiplayer tech demo that didn't immediately slow to a crawl? And, more importantly, how could that technology be used to keep EVE Online relevant? On March 20, 3,852 human players and 10,422 AI pilots participated in the first public tech demo of Aether Wars—a barebones space combat sim using EVE Online's art assets. The idea wasn't to perfectly recreate EVE Online's fleet combat, but to see if Hadean's Aether engine could handle ten thousand ships and hundreds of thousands of torpedoes in one area without crippling lag. As you can see from the various livestreams of the event (like the one below), it was far from perfect. But it did work. Players could fly around and fire weapons with hiccups of lag that were much more tolerable than the crawl EVE Online's real battles turn into. It worked better than both CCP and Hadean had hoped for. A day before the tech demo, I caught up with CCP Games CEO Hilmar Pétursson to talk about the project and what it could mean for the future of EVE Online. "There are pretty good odds of it just crashing and burning," he told me. "EVE players are known for tearing apart whatever we throw at them. Either outcome is a good one, though, because this is such cutting edge technology we just have to learn the boundaries and the opportunities through these kinds of experiments." The gist of what Hadean's tech does differently is in how it seamlessly scales to match the complexity of a game world without tons of bloat or middleware. Using cloud technology (not to be confused with the cloud tech powering Google's Stadia streaming service) and its proprietary operating system, Hadean's Aether engine will supposedly be able to handle complex simulations—like 10,000 ships launching missiles at each other—without skipping a beat. That could change a great deal about how EVE Online's battles play out. "The [infrastructure] of EVE was largely set in place about 17 or 18 years ago," Pétursson said. "Just for perspective, we had dual-CPU pentium 3 servers. Since then the world has moved on many cycles and computing architectures are vastly different, especially when it comes to the number of CPUs and cores in a machine. And EVE cannot properly take advantage of that change because it was architected for a very different environment. It's held up nicely, but there are limits to where we can take it because of this initial condition." That's why CCP is experimenting with Hadean's Aether engine. "The main difference is that Hadean allows the simulation to scale across multiple cores, multiple CPUs and multiple machines, and they have a very elegant way of managing that scale as it happens. And that is something that is hard to do with the architecture that we have for EVE," Pétursson explained. This will massively change tactics of engaging in fleet fights. Though Pétursson said it was impossible to predict when EVE players could benefit from this technology ("It's just so much speculation on so little data, it's just not productive"), the implications are game changing. For one, it would mean no more Time Dilation (TiDi). Introduced back in 2011, TiDi is CCP's only way to combat the massive lag of its player battles. Since its servers struggled to keep up with the millions of processes happening at once as players fired weapons, launched fleets of attack drones, or repositioned ships, TiDi slows everything down so the servers can catch up. It's like bullet-time from The Matrix, which sounds cool until you're stuck in a battle that has been going on for eight hours because everything is moving so slowly. Under full TiDi, any action that should only take one second actually takes ten, stretching EVE battles into gruelling 14-hour-long conflicts. But using technology like the Aether engine could also expand EVE Online's physics simulation, allowing for more diverse ship designs and more realistic battles. "There are limits to the variables that are managed by the physics engine," Pétursson told me. "One of them, particularly, has to do with rotation." One of the corners CCP Games had to cut to get EVE Online running smoothly back in 2003 has profoundly shaped its fleet tactics: The EVE servers have no idea which direction any ship is facing at a given time. That little detail has big consequences on EVE's fleet tactics and ship design. "Not knowing the orientation of the ship means you cannot build a ship with guns on one side and not the other side," Pétursson said. "That's why all the weapon systems of EVE are mirrored." "One thing that the Hadean solution will enable is that once [the server] knows a ship's orientation, we can start to make asymmetrical ships for real. You can imagine a fleet fight under those conditions would be very different. We can start to make ships that are shield ships that protect ships that are behind them." Another big change would be proper simulation of line of sight. Right now, there's no such thing as "taking cover" in EVE Online. If an enemy ship can lock onto you, they can shoot you no matter what might be in the way. But if EVE Online's servers had the processing power to calculate line of sight at a massive scale, EVE's fleet battles would look completely different. So much of what makes EVE Online special is the incredible tales of conflict and betrayal that its players create on a daily basis. For years, PC Gamer has been telling these stories, and now they're all in one place for you to read. Here are the greatest stories of EVE Online. "When you look at a typical fleet fight, often the tactic is to make a big ball of spaceships which is what you'd do if there was no line of sight occlusion," Pétursson said. "When you have line of sight then you have formations because it's important that everyone has a clear line of sight to the target. You go from being a giant ball to having a shape to the battlefield. This will massively change tactics of engaging in fleet fights." But change is scary. Assuming that the Aether engine does one day power EVE Online, it's likely that major changes to EVE's combat would be gradually rolled out in a contained way. Much like its Abyssal Deadspace expansion, which added dungeon-like encounters instanced from the open universe of New Eden, this new form of ship combat would be localized to a small portion of EVE instead of just rolled out to the entire universe all at once. "Obviously we don't want to overly disrupt the current gameplay, which people engage with on a daily basis," Pétursson said. None of this is guaranteed to happen, either. Though the Aether Wars tech demo was a success, it could be years before EVE players see tangible changes to their game. Pétursson told me it's one of CCP Games' few long-term projects that are being offset by more immediate changes, like the upcoming 64-bit client and DirectX 12 support. "The Hadean thing is more like a leap into the extreme future of what could be done. But these incremental and revolutionary initiatives inform each other." 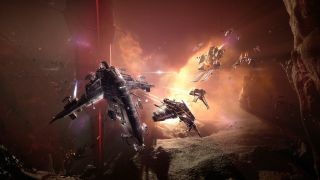 It's exciting stuff that could see EVE Online keep pace with the new wave of combat space sims like Elite: Dangerous and the upcoming Star Citizen—but with EVE's massive, player-driven universe behind it all. But at what point is CCP just developing an entirely different kind of space game? "At some point we are developing a different space game," Pétursson laughed. "But if we're going to stay true to EVE Online going on forever, then at some point the current gameplay of EVE is just not going to be as relevant as it was. As we have more space games coming online, the gameplay and the simulation dynamics also need to evolve. But we have to be very careful about doing that."